Kara Tippetts's story was not a story of disease, although she lost her battle with terminal cancer. It was not a story of saying goodbye, although she was intentional in her time with her husband and four children. Kara's story was one of seeing God in the hard and in the good. It was one of finding grace in the everyday. 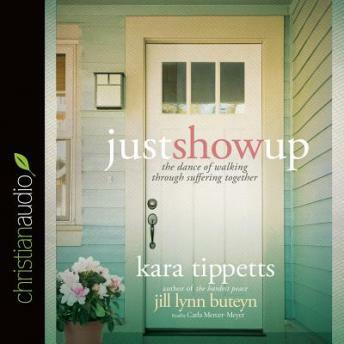 And it was one of knowing "God with us" through fierce and beautiful friendship.In Just Show Up, Kara and her close friend, Jill Lynn Buteyn, write about what friendship looks like in the midst of changing life seasons, loads of laundry, and even cancer. Whether you are eager to be present to someone going through a difficult time or simply want inspiration for pursuing friends in a new way, this eloquent and practical book explores the gift of silence, the art of receiving, and what it means to just show up.